Is supplementation with elemental diet feasible in patients undergoing pelvic radiotherapy? For a long time, researchers and clinicians treating individuals with gastrointestinal diseases believed that good therapeutic responses were only possible if the bowel was completely at rest. This meant that most patients were only able to gain necessary nutrients through intravenous feeding, which often meant longer hospital stays that still did not completely resolve these GI issues. As a result, physicians began to investigate how a diet consisting of foods that were already in their “pre-digested” state may improve patient outcomes while also giving them a greater quality of life in the process. In this article, we will detail everything you need to know about the elemental diet so that you can decide if this treatment approach is right for you. As you will see, using the elemental diet for SIBO treatment, inflammatory bowel disease, and other digestive issues is very effective. 1 What is an Elemental Diet? 8 When is the Elemental Diet Recommended? 9 When is the Elemental Diet Not Recommended? 18 You Just Finished the Elemental Diet – Now What? Very simply, the elemental diet is a liquid formula (usually in powdered form) that contains all the essential nutrients humans need to live broken down into their simplest forms so they are easily absorbed. By eliminating the need for the GI systems of these patients to perform normal digestive functions, as well as limiting the fuel source for bacteria, the elemental diet acts as a protective way to ensure that patients still consume all the necessary nutrients during this treatment period while allowing the bowels to rest and decreasing bacterial overgrowth. As a result of an alteration in the type and/or number of bacteria present within the small intestine, patients with small intestinal bacterial overgrowth (SIBO) often experience a wide variety of GI symptoms including bloating, abdominal pain, diarrhea, constipation, gas, cramping and more. As one of the most promising treatment options for patients with both moderate to severe SIBO, the elemental diet is a life-altering tool that has helped many patients reduce bacterial overgrowth and re-establish a more normal gut. Compared to using antibiotics for SIBO treatment the elemental diet has been shown to be even more effective. Patients who were prescribed Xifaxan had a success rate of approximately 64%, while patients who underwent a 2-week elemental diet had a success rate of 80-85% in eradicating SIBO. The success of the elemental diet for patients with SIBO is primarily attributed to the pre-digested state of the nutrients which are quickly absorbed, preventing the surplus of bacterial species from feeding on carbohydrates. By starving bacteria in this area, an elemental diet is an effective tool in reducing bacterial overgrowth in the small bowel 4. If using the elemental diet for SIBO, it’s recommended that you use it for at least 2 weeks if not longer to see results. This allows the bowel rest and enough time to reduce bacterial overgrowth in the small intestine. So what’s the difference between a “full” elemental diet and a “semi” elemental diet? In terms of the elemental product formulations, the main difference is usually in the protein structure. For example, a “full” elemental formula is usually just composed of free-form amino acids while a “semi” elemental formula has longer chains of amino acids or protein peptides like whey isolate. In terms of the elemental diet treatment process, a “semi” elemental diet could also be when someone uses an elemental formula like Absorb Plus or Vivonex Plus and combines that with real foods using the elemental formula as a supplement for a certain amount of meals or extra nutrition. Various scientific studies have found that patients with GI disorders show a beneficial response when their normal diet is supplemented with elemental formulations. In fact, these studies show that a full elemental diet may actually suppress the patient’s diet and ultimately reduce their ability or interest in consuming normal foods following the completion of their elemental diet regimen. Overall, it has been shown that “semi” elemental diets are just as effective if not more effective in patients as compared to full elemental diets. The elemental diet has become an increasingly popular treatment option recommended by physicians as clinical research has continued to demonstrate the efficacy of this treatment option for SIBO, as well as a variety of other GI disturbances 5. Below are some of these studies and the results of patients’ health following completion of the “full” elemental diet. Table 1: Collection of clinical research studies supporting the elemental diet for treating a variety of GI disorders. It is important to note that the “full” elemental diet will only contain protein sources in their free amino acid form, carbohydrates in their simplest form of oligosaccharides or monosaccharides and fats as medium-chain triglycerides (MCT). On the contrary, the semi-elemental diet instead can contain protein in the form of peptides of varying chain length, carbohydrates in the form of simple sugars, glucose polymers and/or starch and fats as MCTs. One of the biggest advantages associated with the semi-elemental diet in comparison to the full elemental diet is attributed to the different protein forms used in these two diets. While the free amino acid forms used in the full elemental diet prevent the patient from experiencing any type of allergic reaction to the protein component of the formulation, this form of protein does not prove to be effective in improving weight gain and/or malnutrition issues. In fact, research has shown that free form amino acids cannot help build muscle for patients unless they piggyback on a dipeptide (or higher) protein bond 6, such as that which can be found when consuming whey isolate, for example. To learn more about this process, see this paper. Basically, a high-quality semi-elemental diet formula or semi-elemental diet that includes a little bit of food can be even better than a full elemental formula. Table 2: Collection of clinical research studies supporting the semi-elemental diet for treating a variety of GI disorders. Semi-elemental diet has proven beneficial for patients in “high-risk” categories, such as those with Crohn’s disease, short bowel syndrome, etc. I had a chance to sit down with Jini Patel to discuss the elemental diet and her experience working with people around the world to heal their guts naturally. So, you’re thinking of using the elemental diet for SIBO or another gut illness. These are the pros and cons you should consider. When is the Elemental Diet Recommended? When is the Elemental Diet Not Recommended? It’s not uncommon for individuals on the elemental diet to experience a variety of side effects, mostly due to the ingredients in the formula or the “die-off” reaction to a changing microbial environment. Can be treated with magnesium, suppositories, enemas, herbal laxatives, etc. One of the most important aspects of the elemental diet is ensuring that you are consuming a sufficient amount of calories each day throughout the duration of your elemental diet. This is particularly important for individuals who are interested in maintaining their weight during this time. If you are using just elemental shakes on your diet then you need to make sure to get the recommended amount of calories for your body weight. Be sure to use an online nutrition calculator to figure out how many calories you need, then order the correct amount of product for the duration of your treatment. Currently, there are a few main elemental formulas on the market. Check out the table below to compare the main elemental formula options. Absorb Plus is a high-quality elemental formula and one of the best. Some consider it a “semi” elemental formula due to the whey protein isolate but this allows you to pack on muscle and maintain weight more effectively. The product tastes good and has been used successfully by many people with IBD and IBS. 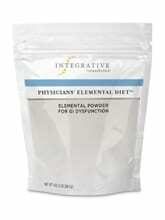 The Physicians Elemental diet is another high-quality elemental formula. It is a “full” elemental formula because it contains protein in the form of free-form amino acids. This product tastes excellent as well and many people have used it successfully. A prescription is required to order the product. Vivonex Plus is a full elemental diet product that contains free form amino acids and corn maltodextrin as the carb source. The ingredients in this formula are low quality and it tastes nasty. Many people have had successful results using the formula but it is very difficult to get down due to the horrible taste. In summary, we recommend using Absorb Plus because of the quality of ingredients, taste, and the protein structure which will enable you to put on muscle and maintain weight while on the elemental formula. With Absorb Plus you can also control the amount of fat depending on your bodies tolerance and requirement. A patient may be interested in creating their own elemental diet formulations for a variety of reasons. Some patients have found that a homemade elemental diet was better for them because they could customize the ingredients used and switch up the carbohydrate and fat ratios. You can also save a little bit of money taking the DIY route. But, this method usually takes more research, time, and commitment to figuring out the exact specifications. You Just Finished the Elemental Diet – Now What? Most often it’s recommended that patients who have successfully completed the elemental diet slowly transition back to actual foods by beginning with broths and a low FODMAP diet over the course of a week. Additionally, it may be beneficial to continue to supplement with elemental formulations during this transition period. It is also highly recommended, particularly for patients with SIBO, that immediately after completing the elemental diet that they begin to take a prokinetic supplement to help stimulate the migrating motor complex which helps prevent the re-growth of unwanted bacterial populations. To learn more about what a prokinetic drug is and how it can help you, click here. In conclusion, the elemental diet is a great way for patients struggling with GI issues, nutrient absorption or a wide variety of other health issues to absorb important nutrients through their diet! The benefits associated with both full elemental and semi-elemental diets are well documented. While there are some formulations such as Vivonex Plus, which are hard to tolerate, there are a couple other products available, such as Absorb Plus, that can help make this diet a little easier on your taste buds. With over an 85% success rate, particularly in patients with SIBO, the elemental diet is a clearly valid and highly recommended treatment option that may help you. Still not sure which treatment is best for you? Learn more about the different treatment options for SIBO. Good question. No, it doesn’t matter if you have constipation or diarrhea. It works effectively for both. Thank you so much for all the details. Most info on the web details what the ED is and how to do it but not so much what to expect while you’re actually on it, in terms of how you’ll feel. Is it normal to feel hungry and a bit fatigued or weak throughout the process (especially when doing the full ED with no whole foods)? I am on day 2 of the Physicians Elemental Diet and feeling pretty out of it. Wondering if that is normal and will persist throughout or will improve as my body adjusts? Yes, this is normal. Often times at the beginning people can experience some adjustment symptoms while the body is adapting to just the liquid formula and the bacterial are being starved. I usually find that the first week is challenging to adjust but the second-week symptoms decrease a lot. In need of some advice, I have recently completed a course of SIBO antibiotics (from the uk btw), I had severe symptoms such as weight loss and severe nausea. I feel better than before but I feel like my symptoms are coming back.. (I stress a lot). I don’t want to keep taking antibiotics and I want to be free of this once and for all. I am considering the elementary diet. Any advice is appreciated. The elemental diet is definitely a great option to consider using! Thank you for a good and helpful blog! I know there’s a dextrose free version of the elemental diet out there.. I was wondering if it’d possible to make one of these at home? if I’d be possible to just skip the dextrose in the recepie or if I need to replace it with something? I have high levels of candida and also parasites.. Yes, you can make it at home if you want using Mike’s mix tapioca maltodextrin. Honestly though, I would recommend using Absorb Plus unsweetened vanilla as it is dextrose-free. Another product that is dextrose-free is the physician’s elemental diet but I usually recommend Absorb Plus first. It’s so much easier to order the product so I would recommend that first. It’s possible to have die off symptoms at the beginning or symptoms due to the elemental formula. Make sure you are getting enough calories and drinking it slowly throughout the day. Tomorrow Im going to see a GI for the 5Th time…. none of them had experience with sibo. Usually, a lot of people who have problems with dairy actually can tolerate absorb plus since it contains no lactose and is a good source of whey. I know a few cases where people who had problems with dairy were able to tolerate absorb plus just fine. That being said, yes I’d recommend the physicians elemental diet if you don’t want to try absorb plus or another option is making your own version using vegan protein powder. I started the dextrose free diet yesterday and had a terrible day, nearly ended up throwing up. I’m really struggling with the taste and nausea and it takes me 2h to drink one scoop. Yesterday I only managed to drink 600kcal which obviously is not enough but I just can’t get it down so I’ve started eating a bit of chicken. What foods are allowed on semi-elemental diet? All animal protein that I have no trouble digesting? What about non starchy vegetables? Sorry about that. THe semi-elemental diet is a term used to describe elemental formulas that have protein peptides in them like whey isolate or brown rice protein. When your read “semi-elemental” it means the formula has larger protein molecules compared to free form amino acids like in the physicians elemental diet. I think you are referring to the “half-elemental diet” where you use the elemental formula for half of your calories and real foods for the other half. Since you’re having issues you can definitely try doing a half elemental formula and drink your liquid for half your calories during the day and eat a low-fodmap diet for the other half of your calories. Hope that makes sense. Ah ok thanks for clarifying. Not sure if I can do low fodmap to kill SIBO as it hasn’t worked in the past. So I think I will just stick to chicken and fish if I can’t drink all the calories that my body needs. I’ve just started the Dextrose-Free Physicians Elemental Diet and it tastes better than most protein shakes I’ve tried. Yep, the taste is good. How is the half elemental working for you Heli? I just started the Full ED and am thinking of doing fish, meat and chicken in addition to the drink… but I am wondering if it works as well. Josh.. can you weigh in on this as well? thank you so much. Half-elemental die works well also and can be used over a longer period of time. It really just depends on what you want to do. Half is much more gradual while the full will work quicker and you may experience more pronounced die off the first week. I’m curious, in the article it mentions wanting the carbs to be monosaccharides which I get. The Physicians Elemental Diet has tapioca maltodextrin. Isn’t that a polysaccharide? Curious if you knew. I was interested in doing the Physicians Elemental Diet Dextrose Free as it tastes very good. Thanks for any insight you have on this. While maltodextrin is considered a polysaccharide it does not act as one in the elemental form of maltodextrin. I know this is a little bit confusing but it is absorbed as quickly as glucose so there is nothing to worry about. I’ve tested all the possible carbohydrate sources for the elemental formula including dextrose, maltodextrin, glucose, and cyclic dextrin. Tapioca maltodextrin was the best and caused the least symptoms. I would do the physicians dextrose-free version. Thanks Josh- I had a quick question for you. Are you still doing a modified SCD diet? Did you find you made progress sticking with SCD but adding in rice & potatoes? Did you stick to 1/2 cup of each the low fodmap serving size? How much carbohydrates did you have per day if you don’t mind me asking of the safe-starches like potato & rice? Thank you for all of that information. I bought the Dextrose free version from Physicians Elemental Diet and the taste is actually very good. All of that info makes perfect sense now. Thank you for this info! I just started Allison Siebecker’s Elemental Diet and I’m wondering if the honey is necessary or just for taste? I’m having a hard time getting down 2 tablespoons, 3x a day. If you’re using honey as the carbohydrate source it’s definitely necessary. If you can’t tolerate honey you can also use a different carb source like tapioca maltodextrin. I love ypur blog, it is sooooo very helpful to be able to find free info on this difficult disease called “SIBO” I just started the Physicians Elemental Diet at the end of March and will go to the end of April, but I’ve gotten weak a couple of times and ate some grapes. Can you please tell me what that does while on the diet…….does it put me back to the beginning of yhe healing process or what???????? I would not advise eating grapes while on the elemental diet. You want to stick to just the full elemental formula if you’re using the product as a treatment. If you’re having issues with blood sugar swings which may have been the cause of your weakness the solution is to drink the formula slower throughout the day and consistently not like a regular meal.